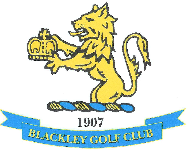 Blackley Golf Club has a well deserved reputation as being a visitor friendly club and we are proud to extend a warm welcome to all. Many of our societies have been playing here for several years and we receive a considerable amount of repeat bookings. In addition to enjoying your game of golf there are opportunities to relax in our spacious bar areas, partake of a delicious meal and watch Sky Sports TV. For visiting parties such as corporate days or golf societies, we can provide pre-set menus at very competitive rates seven days a week. We also have an outdoor balcony area overlooking the course for al-fresco dining and barbecues in the summer. Our dedicated hospitality team can cater for all tastes and we can tailor the package to suit your pocket. We also have a comprehensive range of beers, lagers, spirits and wines at very competitive prices. For a personalised service, just contact the Professional on 0161 643 2980 or email: mail@steveinghampga.com and see what we can offer.